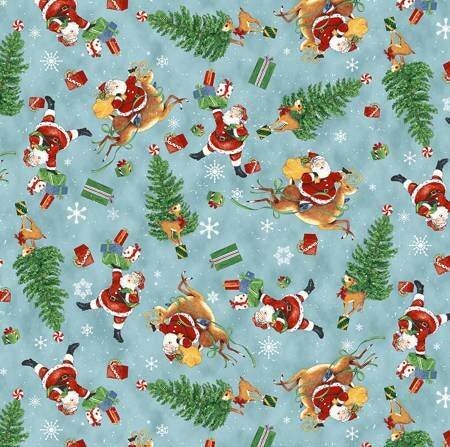 A fun and beautiful retro Santa Holiday cotton fabric from Cloth Works. A soft blue background with a retro santa flying through the sky on Rudolph with his bag full of goodies for all good girls and boys. Christmas trees in deep forest green with a red and white peppermint candy tree topper. Christmas presents in red, green and gold dance across the fabric. Beautiful deep colors of red, green, gold, brown and blue is what you will see on this great holiday fabric. Team this print up with it's coordinating prints and make a stunning Christmas quilt or table topper! All fabric from The Quilted Nursery Children's Fabric Store is cut directly from the bolt and we now offer fractional yardage cuts for your shopping convenience. All shipping overages are refunded upon shipment of fabric. Lovely fabric. Thanks a bunch!